Intel showed off its first low-power system on a chip product for the data center on Tuesday, in what looks like a credible part for highly-dense, low power webscale machines — a segment Intel (s intc) calls microservers. Diane Bryant, vice president and general manager of Intel’s Datacenter and Connected Systems Group, explained that the SoC combined the low-power 64-bit-capable Atom core with networking capabilities on a die that consumes a total of 6 watts. Bryant also added that the SoC has already made it into 20 designs so far, and that an unnamed storage vendor even swapped out an ARM design for the Intel SoC. And that’s what this press conference was all about: “Today there is no enterprise-class ARM-based server chip,” said Bryant in response to a question, but that competition is coming next year and Intel can’t afford to get caught flat footed. After a few years of actively denigrating the idea of lower performance but power efficient chips in the data center, in 2011 Intel finally got the microserver religion, releasing a product roadmap and predicting the segment might become about 10 percent of the server market. But other than make a special 64-bit part for SeaMicro, which shoves hundreds of low-power Intel Atom chips into a dense machine, Intel talked a good game but didn’t seem to be excited about the opportunity in the way that ARM or other chip vendors such as Tilera were. It even let its rival AMD walk off with SeaMicro. Anyways, the problem for Intel is that they are very reluctant to even promote Atom for micro-servers, and it shows from how they talk about it. They have a conflict of interest, because they’d rather sell the much more profitable “bigger” chips. The reason why this is a problem for Intel is because ARM has absolutely no problem trying to sell ARM chips for servers. In fact they have all the incentive in the world to do it, while Intel has the least incentive to do it. As Clayton Christensen puts it, Intel will be “happy to concede the low-end, non-profitable (for them) market to their disruptive competitors”. Intel was a case study in Christenson’s Innovator’s Dilemma, so its position here is ironic. But despite analyst worries that Intel will see its margins drop from the mid-60 percent range to the 50-percent range in the coming two years (in part because it will have lower-margin chips but also because its overall competition will be tougher with ARM-based cores in the market). 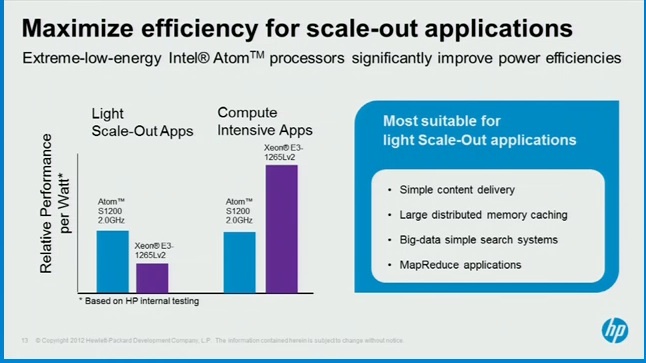 But Intel did note in its presentation that a highly dense Atom SoC configuration in a rack would net more revenue than a rack of fewer Xeon processors (there were roughly a fifth of the number of Xeon chips in that rack configuration). It was a bit more vague though, on the margins. It’s well known in the chip world that Facebook, as a large buyer of chips, isn’t shy about testing products from alterative chip vendors such as Tilera in hopes of keeping pricing pressure on Intel. What’s more interesting is if other vendors start doing this. At that point, Intel may have the products and features on its chips that webscale customers want, but it will have to be competitive on price in a way that it really hasn’t had to be when it was just competing against AMD. Facebook has said it will use these wimpy cores(one promising segment might be in its planned cold-storage architecture), but the jury is out on which vendor will win its business. Intel clearly intends to fight for Facebook and other webscale business, but when it does, it’s going to be facing up against some real competition — competition that it hasn’t faced before in the Intel/AMD world. Intel can’t concede any market if they do, they only get pushed out faster. ARM is not stopping at microserver , that’s only the starting point. Nvidia’s Project Denver will go into Tesla products for high perf computing (and yes that is actually public and verifiable info not a guess).